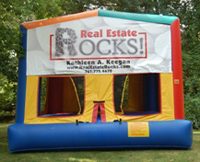 Local non-profit events can cash in on a donation of a moonbounce rental donated to their event from Kathleen Keegan, broker/owner of Real Estate Rocks. Kathleen Keegan and her team at Real Estate Rocks, a Pembroke-based residential real estate agency, want to give back to the community and donate a 15 x 15 moonbounce to Non-Profit/Charity/Fundraiser events. To book the moonbounce, contact Kathleen Keegan at Real Estate Rocks at 781.775.4670 or email us. Event organizer to pick up/return moonbounce to Country Rentals or pay delivery and set up fee (fee varies depending on location – approximately $50).